I don’t see countries in black and white, I see them as specific colours. Japan is pink, England is green and Australia is a golden orange. Heading to Bolivia, I know I am going to see red. And then, what appears to be an infinite amount of white. 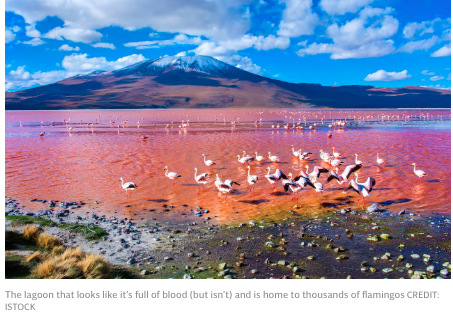 Shortly afterwards there’ll be a lagoon that looks like it’s full of blood (but isn’t), home to thousands of balletic pink flamingos, surrounded by explosive geysers and rainbow-streaked mountains. Bolivia is nothing if not vivid and consistently strange. First and foremost, though, I’m on a mission to seek out the colours and experiences associated with two of the country’s icons: its salt and its peppers. The former covers a vast area of some of the most unpopulated land mass to the south-west, while the latter is an integral part of agriculture and daily life in the kitchens of towns and cities around the country. 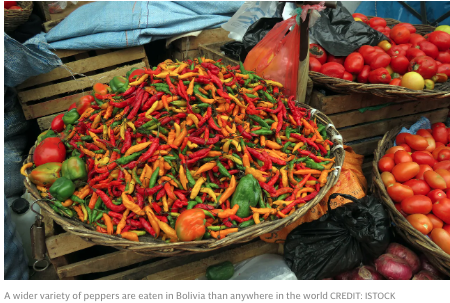 A wider variety of peppers are eaten in Bolivia than anywhere in the world. Some are spicy, some sweet, all are super-bright. The official flag of Bolivia is a prosaic tricolour of red, yellow and green with a coat of arms in the middle, adopted in the mid-19th century. Both salt harvesting and pepper farming had been an occupation for generations by then. The Wiphala, which represents the indigenous populace, still flies nationwide. With its complex pixel-like collection of colours banded with a central diagonal of white, it seems apposite. This is a place where the landscape changes like a Dalí fever dream with each turn of a corner. And – as I considered while hopping perilously but gleefully around and between spluttering mud geysers, and in the unique solitude that going without phone and Wi-Fi for a prolonged period brings – it’s a place that has yet to be wrangled by the nanny-like niceties of so much vanilla global tourism. It is piquant. The colours of Bolivia’s most celebrated condiments, salt and pepper, aren’t as prosaic as “red and white”. My first stop-off on the capsicum trail was in the Sunday market at Tarabuco, a 90-minute drive from the constitutional capital of Sucre. Here, women in the vernacular dress of voluminous pleated skirts and fancy hats manned stalls selling Bolivian peppers, a fruit that changes colour while growing, from purple through yellow and orange to primary red. There were other sweet and spicy varieties, and some purely used to add a blast of colour to a dish without much impact on flavour. Elsewhere in the market there were stalls selling the greasiest fried chicken, unfiltered cigarettes, plastic gallon containers of 96 per cent-proof alcohol (marked “potable” in case of any doubt as to usage) and ceremonial “mesa” wraps to burn as offerings to Pachamama – Mother Earth. Bolivians live fast and well, but hedge their bets. 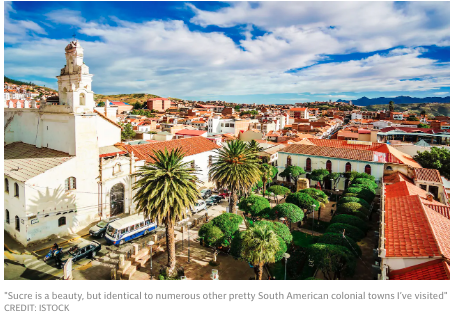 Tourism is an increasingly significant business in Bolivia, but it’s nowhere near as developed as in, say, neighbouring Peru. And perhaps all the better for it. With a week to spare in which to see the most dramatic sites in the south of the country, I’d spoken to guides at Journey Latin America about the best route to take, and I wanted to spend three quarters of that time on the salt flats. One of my favourite journeys of all time was crossing the Salinas Grandes in Argentina, and I knew I’d want to spend as long as possible in the Bolivian counterpart. I wanted to savour that flavour again. After some jiggery-pokery with flight schedules and connections, I shaped something accordingly. I visited Sucre and Tarabuco en route to the Uyuni salt flats, deliberately trying to avoid the higher altitudes of La Paz while my lungs adjusted. Even at the relatively gentle height of 9,220ft above sea level, I found the hills left me breathless. Sucre is a beauty, but identical to numerous other pretty South American colonial towns I’ve visited, right down to the central market with its stalls and stalls of eggs, fruit and, of course, peppers. 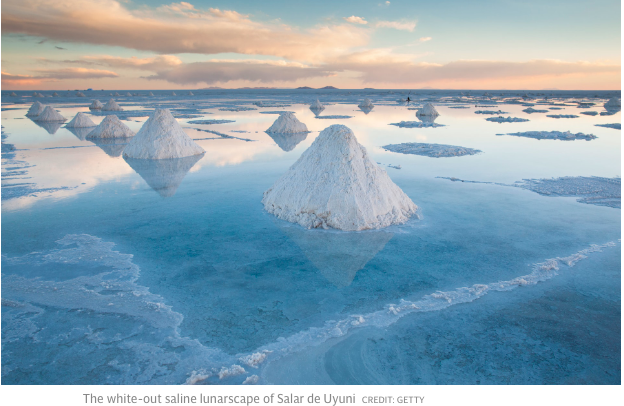 Most of my time was spent in the Uyuni region, and the white-out saline lunarscape of Salar de Uyuni, the result of vast ancient lakes that have dried and transformed into a perfectly flat salt crust stretching as far as the eye can see. I split my time between a hotel – the surprisingly chic Hotel De Sal Luna Salada, made of salt bricks and with a nice cocktail bar attached – and a caravan. But, as befits a landscape as photogenic and weird as the salt flats, it wasn’t just a caravan, it was a curvaceous silver Airstream – a brilliant slice of Thirties Americana, transplanted to the surface of the Moon. Silver on white, the result was blinding, while the contextualisation and styling was next-level. I arrived after a day in a four-wheel drive with our guide Danté, who has Sweet Child O’ Mine as his ringtone and a quirky penchant for singing Highway to Hell at the more perilous points of off-roading. As I pulled up, there was a flaming brazier on the crystalline white ground in front of the caravan, along with a row of cocktail ingredients on a table. As an overly literal and more contemporary riposte to Danté’s tastes, I put on I Should Live in Salt by The National to accompany the sunset. I sat in a campsite rocking chair and marvelled at the infinite beauty of it all. When you’re driving across the salt flats in an off-road vehicle, the flatness, and indeed the white saltiness of those aforementioned flats, gives the impression of an eerily smooth crossing over water. Viewed from slightly above, from the cacti-covered “shores” of Isla Incahuasi, close to the location for the finale of The Last Jedi, it looks like snow. From higher up, from the coloured stripes at the base of the Tunupa volcano, it could be cloud. Back down on its surface, I circled the Airstream in giant loops on a mountain bike. Even with a thick layer of Neutrogena Factor 70, I could feel – as I sat down in the caravan to shelter from the high winds and to eat a plate of surprisingly excellent wholewheat spaghetti al pesto with a bottle of 2015 local syrah – that my Celtic skin had been utterly incinerated. But it had been worth it. I could have spent a week happily just taking photos of the salt flats while the flesh gradually peeled off my body. 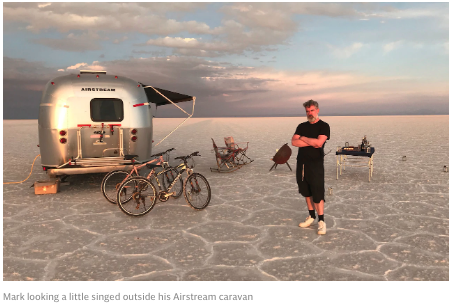 I can’t think of many times in my life I’ve been happier than when mooching about outside that Airstream caravan, or indeed the salt hotel. But Danté took me to see ever more incredible sites: ancient mummies in a cave next to the volcano, and a graveyard that I insisted on stopping at in the nearby village of Tahua, which mixed Inca pagan elements with straight-up Catholicism. Instead of flowers, each headstone had been decorated with purple tinsel. It was joyful, life as well as death-affirming and – in this Martian landscape in particular – really quite camp. Like the best travel experiences, it made me smile involuntarily and broadly. If the cemetery was a reminder that the salt flats are a place where people are born and die, there was plenty of evidence of what they do between the two. And living a life here must be strange, as epitomised by the home and garden of local artist Santos Quispe – the Museo de Chantani. The term “museum” might be pushing it, but it was wonderful in its way. Quispe is a kind of Bolivian Derek Jarman – he has arranged the volcanic stones in his yard as pagan totems, with mammal-shaped rocks wearing alpaca skulls as masks. Indoors, there was a collection of poor and weird taxidermy, animal skeletons, an old gramophone player and vinyl, coins and dolls. It, like the mummies and cemetery, appealed immensely to my taste for the strange and macabre. Here was an interior that befits the weirdness of the salt flats. The most dramatic space I found by far, however, was the Chiquini cave, which would have originally been entirely submerged, before volcanic activity wiped out the lake that once sat there. The cave looked like it had been art directed rather than discovered, with an unnerving and intricate series of panels erupting from top and bottom with the texture of bat wings, autumn leaves or perhaps flayed flesh. It was both gothic and delicate, and it felt so strange to be allowed to walk around and touch it. Again, there was no one else there. I’d expected the salt flats to be consistently defined by nothingness, but the trail to the border with Peru (I had decided to leave by a land crossing and carry on further south) was punctuated with so many phenomenal sites – both natural and man-made. Shortly after landing at Uyuni, on my way to the caravan, we visited the “train graveyard”, where scores of derailed steam trains and carriages have been left to rot, attracting graffiti and developing a Mad Max patina. I had the place to myself, which – despite the remoteness of the location – still seemed remarkable. This place was amazing and worth flying to see. Last year, in Iceland, I walked the two and a half miles from the main road to a black beach on which lies the wreckage of a DC-3 that crashed there in 1973. When I arrived, the fuselage was covered in tourists with red cagoules and selfie sticks, ruining the mood and driving me mad. Dereliction is best experienced in desolate solitude. A four-hour drive south of those rusted trains, en route to my jumping off point at the border with Peru, I circled the Laguna Colorada, or “red lagoon”. The algae and sun make it look like the aftermath of a recent massacre. But at the same time, it’s dramatically romantic. As we arrived, one of our tyres burst, which was fortuitous more than annoying, as it gave me extra time to walk around the saline and borax sludge, peppered with flamingo carcasses. It sounds ghoulish, but with the hundreds of live pink birds taking flight periodically over the primary red water, flanked by crystal-white water and candy-coloured volcanic hills, it might be the most beautiful thing I’ve ever seen in my life. Here were all the colours of the rainbow – just like the peppers in the market. Here was wildlife, surrounded by salt, preserved by distance from humans. Bolivia is one of the most vividly coloured places you’ll ever see. Go now, before other visitors wear it out and it fades. Journey Latin America (020 8747 8315; journeylatinamerica.co.uk) offers an 11-day highlights holiday to Bolivia visiting La Paz, Santa Cruz, Sucre, Potosí and the Uyuni salt flats, sleeping in a deluxe Airstream camper, from £4,664 per person. The price includes flights, transfers, excursions, accommodation, breakfast and full board in the salt flats.